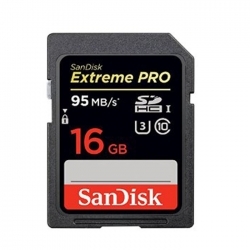 The 16GB Extreme Pro SDHC UHS-I Memory Card from Sandisk offers you reliable and secure performance under a wide variety of scenarios. The card is shock, water and X-ray proof so for the working pro, this is a card that deserves serious consideration when durability is an issue. The fast write speed delivers faithful and true service - and when you're trying to get the shot and time is of the essence, that's exactly what you want from a memory card. The built-in write protect switch prevents accidental erasure - a real peace of mind advantage in a card. The advanced Error Correction Code (ECC) engine improves overall data integrity and reliability of the card during read and write. Whether for digital stills or fast video capture, this card provides fast and accurate performance. It comes with a 1-year downloadable RescuePRO data recovery software offer, for bringing accidentally deleted images back to life.